We’re thrilled to be attending the 5th Anniversary of North America’s most innovative event on digital workplaces, disruptive technologies and employee happiness. Intra.NET Reloaded Boston is the world’s leading knowledge exchange platform bringing together all stakeholders who play an active role in the digital workplace scene. The event provides you with precise first-hand insights into new developments in the digital workplace landscape and boosts your knowledge of strategic and technical aspects of employee communication, as well as change management strategies. Invotra’s COO, Paul Zimmerman, Board Director, Sinead Hunt and Account Manager, Ross Blythe, are very much looking forward to attending and exhibiting at the event. They can’t wait to meet some new faces and welcome all attendees to come and visit the Invotra exhibit at stand 3. 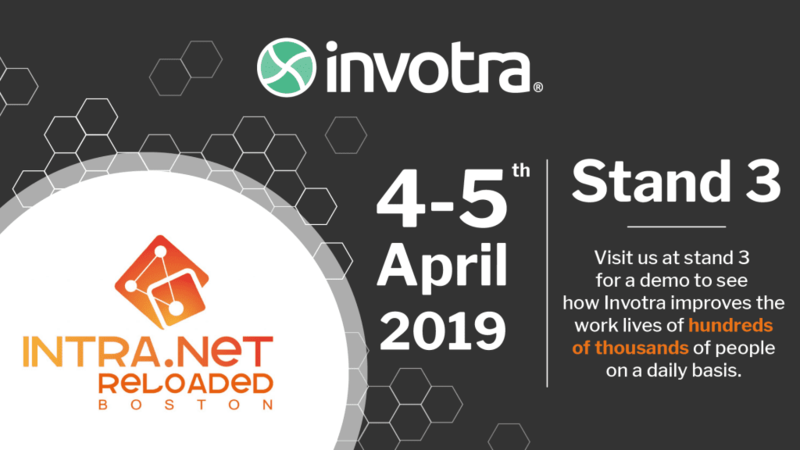 Intra.NET Reloaded Boston is the leading business networking platform for all things intranet and digital workplace. The event focuses on real word end-user case studies and projects dedicated to the development of the bleeding edge digital workplace for tomorrow’s business needs. Speakers from all over North America give insights into their concepts, ideas and challenges and present current technologies and strategies. 200+ senior level experts, thought leaders and influencers discuss the most pressing challenges and solutions, technologies, trends and best practice innovations in the field of digital workplace and internal communication. 50+ industry leaders share experiences, forecast trends & technologies, present their best latest research & solutions, evaluate best-in-class projects and explain development in recent projects. To see the full programme for the day, click here.